Listed below are a number of possibilities for those desiring to be of service to our faith community. Anyone interested may call the office for details and training where necessary. The person suited to proclaiming the Word of God at Mass will have the necessary public speaking skills to read clearly and with expression, striving to convey the meaning of the text. More importantly that person will treasure the Word of God, and the ways in which God has and continues to speak to his people in and through the Scriptures. The Minister of Communion will have a deep and abiding love of the Eucharist. This person will have embraced the celebration of the Eucharist as the “source and summit” of their own lives, and will be willing to be of service to the People of God at worship. Some of our Extraordinary Ministers also bring the Eucharist to our members who are ill or homebound. In addition, we also provide ministers who visit Catholic patients at the Heart Hospital of Lafayette. Serving at the altar is a privilege, in imitation of the One who came “not to be served, but to serve”. We welcome men and women, boys and girls, and delight to have a parent and child serve together. Children should be in 4th grade or above, but may serve from second grade onward if a parent serves with them. The holiest of moments often requires mundane preparations. Our Shamrocks are men and women who are available to do a light cleaning of our church (dusting, vacuuming, etc.) on select Friday mornings, after the 7:30 a.m. Mass. 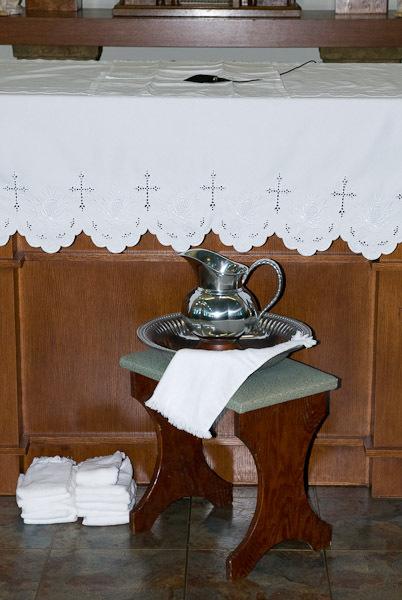 Every time we gather to celebrate Eucharist, we put out fresh linens, the purificators and corporals that drape our altar and use to wipe the cup. Week after week these linens disappear for a time, and return freshly laundered and pressed. St. Patrick hosts several social events each year, including our St. Patrick’s Day Breakfast and the annual Christmas party. These are the people responsible for planning and executing these events. They are our “party people”.